Learn to play the bass guitar. Is there a better alternative to BassChordsLite? Is BassChordsLite really the best app in Teaching Tools category? Will BassChordsLite work good on macOS 10.13.4? BassChordsLite helps you learn to play the bass guitar right away - no experience required! 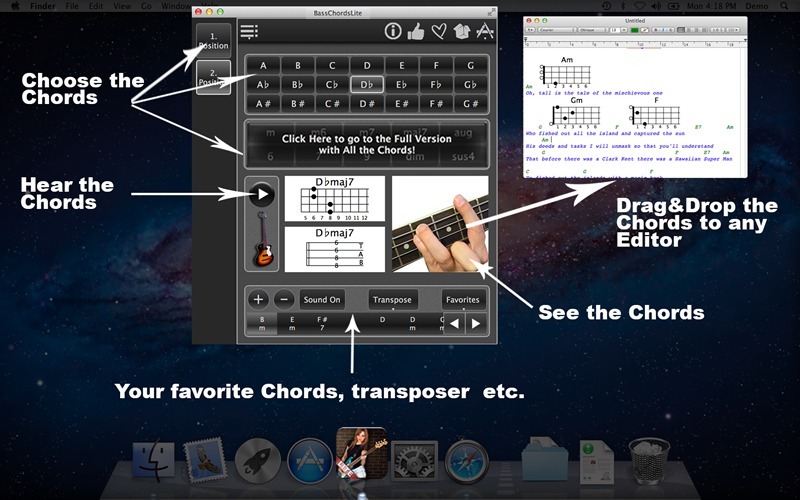 The app contains major guitar chords. Now you do not need to click always the Play button to hear the chords sounds of the favorites. The favorites chords are also clickable now. Added Dialog for deletion of the favorites. BassChordsLite needs a review. Be the first to review this app and get the discussion started! BassChordsLite needs a rating. Be the first to rate this app and get the discussion started!